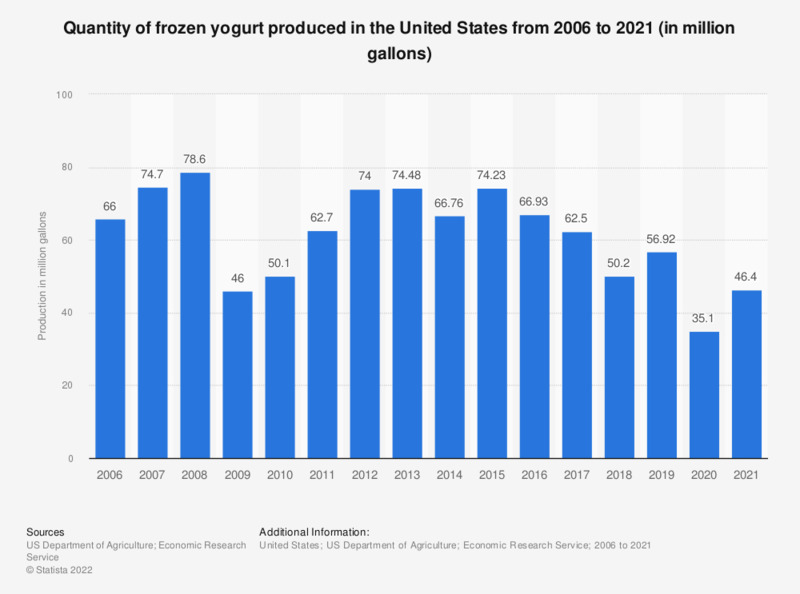 This statistic shows the frozen yogurt production in the United States from 2006 to 2017. In 2016, about 66.93 million gallons of frozen yogurt were produced. Frozen yogurt is a frozen, low-calorie dessert, which is often served in a large variety of flavors. Data prior to 2014 were taken from previous editions of the publication. Everything On "Yogurt in the U.S." in One Document: Edited and Divided into Handy Chapters. Including Detailed References. U.S. population: How many servings of Blue Bell frozen yogurt have you eaten in the last 30 days? U.S. population: How many servings of Healthy Choice frozen yogurt have you eaten in the last 30 days? U.S. population: How many servings of I Can't Believe It's Yogurt frozen yogurt have you eaten in the last 30 days? U.S. population: How many servings of Turkey Hill frozen yogurt have you eaten in the last 30 days? U.S. population: How many servings of TCBY frozen yogurt have you eaten in the last 30 days? U.S. population: How many servings of Edy's frozen yogurt have you eaten in the last 30 days? U.S. population: How many servings of Kemps frozen yogurt have you eaten in the last 30 days? U.S. population: How many servings of Dreyer's frozen yogurt have you eaten in the last 30 days? U.S. population: How many servings of Yoplait frozen yogurt have you eaten in the last 30 days? U.S. population: How many servings of Haagen-Dazs frozen yogurt have you eaten in the last 30 days? U.S. population: How many servings of Elan frozen yogurt have you eaten in the last 30 days?